The United States will be without an aircraft carrier presence in the Middle East for up to two months. The return of the USS Dwight D. Eisenhower to its Norfolk homeport comes “amid a heated fight against Islamic State militants in Iraq and Syria and a slew of burgeoning tensions in Russia, China, and elsewhere,” DoD Buzz reported on Dec. 30. The Eisenhower is set to be relieved by the USS George H. W. Bush, which has yet to depart for the 5th Fleet area of operations and is not likely to do so before the Jan. 20 presidential inauguration of Donald Trump, according to a Navy source. There was a one-month U.S. carrier gap in the Middle East from October to November in 2015. 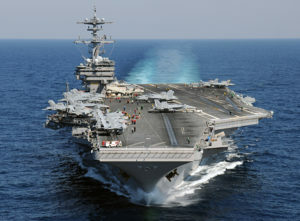 According to DoD Buzz, the current carrier gap comes just five months after Chief of Naval Operations Adm. John Richardson marked a “milestone” for the service: six carriers underway simultaneously, including the Truman and Eisenhower in the Middle East and two deployed forward in the Pacific.